A new book offers practical tips to help teachers overcome challenges and stress. What are your hopes for the new school year? Maybe you want to get better at handling the day-to-day stresses of the job, or be more patient with yourself and your students. One teacher-friend I know says her hope for this year is to learn to “soften more and more into the inevitable chaos and messiness of life.” Can you relate? The problem is, of course, that it isn’t so easy—this softening thing. Elena Aguilar knows this, which is why she wrote the new book Onward: Cultivating Emotional Resilience in Educators. Last year may go down in history as one of pure “survival” for some of us, but why settle for managing or enduring when we have the potential to feel energized and joyful in our work? After all, it’s not ultimately about us—it’s about our students. They need us, with all of our faults and complexities, to walk into the classroom fully present and alive to them. If thriving is your goal, Onward is worth reading. Although Aguilar acknowledges how our neurobiology can influence resilience, she reminds us that we can ultimately become much more emotionally resilient by simply changing our daily habits. Onward (with its accompanying workbook) serves as a practical, user-friendly resource for change—a daily guide for teachers’ personal growth and professional development. With 25 years in education under her belt and a decade as an instructional and leadership coach, Aguilar draws on research in mindfulness, neurobiology, positive psychology, change management, and systems thinking to package a coherent year-long program for developing resilience. She explains that resilience is influenced by four factors: who you are (genetics, values, personality), what you do (habits), where you are (context), and how you are (emotions, dispositions). Aguilar teaches you how to work on these factors with her 12 habits of emotionally resilient educators, which include things like building community, being here now, and taking care of yourself. You can choose to read about one habit every month or go straight to the topics that are most important to you, each of which is supplemented by a long list of daily activities and practices in the companion Onward Workbook. On your journey, Aguilar believes that there are three foundational habits all educators should start with: knowing yourself (purposefulness), understanding emotions (acceptance), and telling empowering stories (optimism). 1. Know yourself. According to Aguilar, to become emotionally resilient, you must begin by exploring the key elements of self: your values, personality, aptitudes, and skills. Aguilar recommends two free online assessments for identifying some of your personality traits and character strengths. If, for example, you can identify one of your personal strengths (like kindness, curiosity, or perseverance) and creatively use your strength every day for a week, you may find yourself happier (and potentially more resilient). To become emotionally resilient, you must begin by exploring the key elements of self: your values, personality, aptitudes, and skills. “When you know yourself well, you gain clarity on your purpose in life and work,” says Aguilar. As you begin to understand and embrace your purpose, skills, and areas for growth, your sense of efficacy can increase—and in one research review, efficacy (or self-belief) was one of the personal resources most frequently linked to teacher resilience. To help you get to know yourself better, Aguilar’s companion workbook includes activities like identifying your hopes, creating a values jar, and crafting a mission statement. 2. Understand your emotions. Once you have a better sense of “who you are,” it’s important to understand “how you are”—what sorts of emotions influence your daily life. By spending time observing your emotions, you can begin to understand how they function. For example, knowing that your fear reaction to an aggressive student (the tensing of your muscles, the increased heart rate, and the tightening in your throat) is both protective and temporary may help you let it go more easily and move toward a more thoughtful response to her anger. This form of self-awareness is one of the fundamental components of emotional intelligence as described by psychologist Daniel Goleman, and studies indicate that emotional intelligence facilitates resilience to stress and may even lead to less burnout. Although Aguilar doesn’t directly cite emotions studies—in fact, most of the research in her book is implicit rather than explicit—she seems to draw on the work of researchers like Paul Ekman and Dacher Keltner. 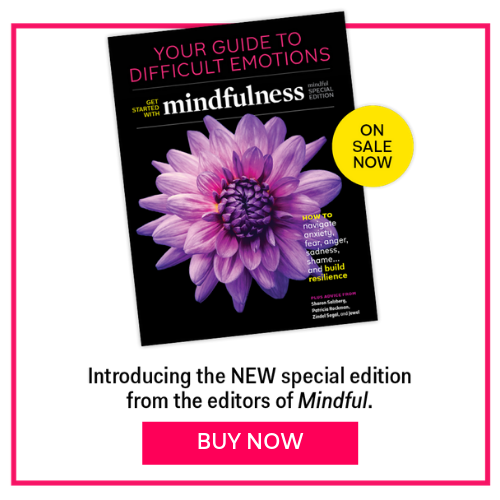 In her supplementary workbook, you can develop your emotional intelligence by examining your beliefs about your feelings, observing your emotions (see sidebar) and how they affect your body, and learning techniques for relaxation such as the body scan. 3. Tell empowering stories. Aguilar also encourages us to focus on the narratives we create to understand (or distort) our reactions to daily events. When we tell positive, empowering stories about our lives, we are likely to feel more optimistic and resilient as a result. One study found that people who experience greater well-being tend to tell stories of change and growth about the obstacles they face. For example, if a new teacher reminds himself that he is a lifelong learner who is improving every day, rather than continually telling himself, “I’m just not a good teacher,” he’s more likely to hang in there and keep trying rather than burn out early in his career. Aguilar draws on work in the field of cognitive behavioral therapy to help you interrupt your interpretations of events, identify common patterns of distorted thinking, and learn how to shift your thinking and core beliefs. When a challenging event happens, our interpretations are often dramatized and exaggerated, but we can shift our thinking by asking ourselves simple questions about the beliefs underlying our thoughts (see sidebar). The Onward Workbook also features activities for increasing gratitude, fostering optimism, and reflecting more broadly on your life story. Apart from the concrete tips and activities featured, Onward doesn’t shy away from bigger-picture questions about how our context can influence our emotional resilience, which is one of the things I appreciate most about it. Aguilar does this by prompting us to examine our “sociopolitical identities” and how they function in schools. In other words, which aspects of your identity are most relevant to you and your work—and which are you most aware of every day (e.g., ability, age, education, marital status, language, race, religion, socioeconomic status)? For example, as a bilingual Latina (woman) who teaches American History, how do you relate to all of the students in your class who are immigrants and refugees? If you are a white woman serving as a principal at an ethnically diverse elementary school, how do you view your position of leadership? Are you aware of your power? Where do you feel powerful and where do you sometimes feel powerless? So grab a group of colleagues and map out a plan (formal or informal) for sharing this resource. It was designed for teachers, school staff, coaches, and site administrators—“any group that operates in or with our educational system.” For further motivation, pick up the workbook; hop on the Onward website for meditations, handouts, blog posts, and videos; or even join the Facebook page to engage in discussions with the larger educational community. Let’s all work together to create spaces where we not only survive but also thrive this year. Amy L. Eva, Ph.D., is the education content specialist at the Greater Good Science Center. She writes for the center’s online magazine, facilitates the Summer Institute for Educators, and consults on the development of GGSC education resources. With over 23 years in classrooms, she is a teacher at heart. She is fascinated by neuroscience, the psychology of learning, and adolescent development and has spent the last 12 years as a teacher educator.